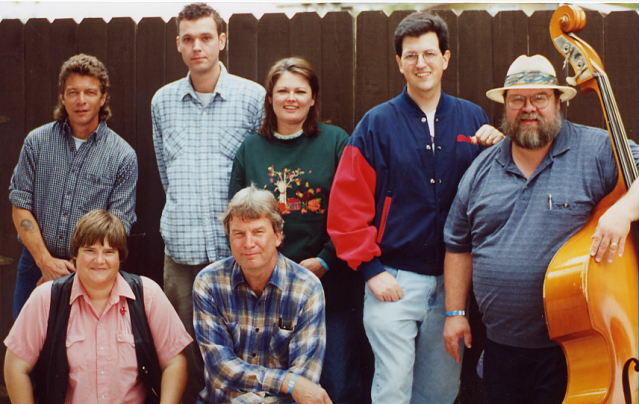 Answering questions after the harmonica workshop at the 2002 Old Settler's Music Festival, Austin, Tx. Apparently the only way to shut my mouth is to put a harmonica in it! The Blazing Bows pose with K. R. Wood and the "Gone to Texas Band" (and "Frontier Three") after their performance at the rededication of Davy Crockett's vest to the museum at the Alamo. We and our coonskin caps were gearing up for a weekend long celebration of Davy Crockett's birthday (August 16th, 2002). 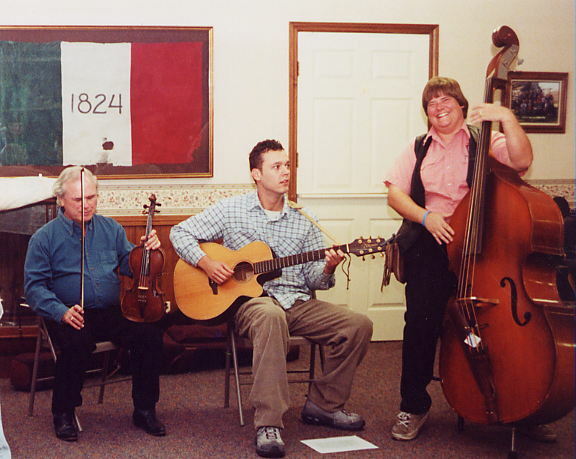 K. R. Wood and the "Gone to Texas Band" play music for Davy Crockett (hero, statesman, and fiddler) at the Alamo. Davy's vest had deteriorated so much over time that it had needed to be preserved. This was the rededication ceremony for the vest's new presence at the museum in the Alamo (San Antonio) which occurred the day before Davy's big birthday party at the Bob Bullock Museum in Austin. The band is joined by a variety of Texas Revolutionary re-enactors -- some of whom also provided the live narration as we performed live the material on the "Crockett Chronicles CD". Davy Crockett's big birthday party whingding at the Bob Bullock Museum. 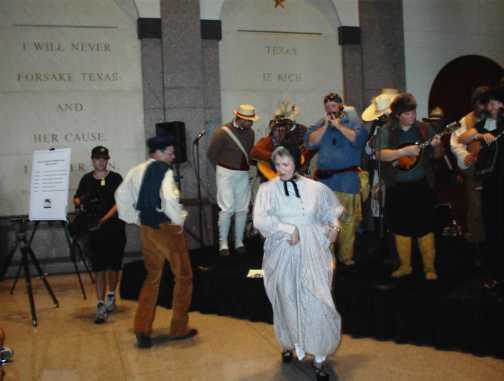 The Bob Bullock Museum was displaying a one of a kind Davy Crockett exhibit at the time and threw a big birthday bash in Davy's honor (August 17th, 2002).